Baltimore Furniture Store Full with Quality Pieces and Variety of Styles! 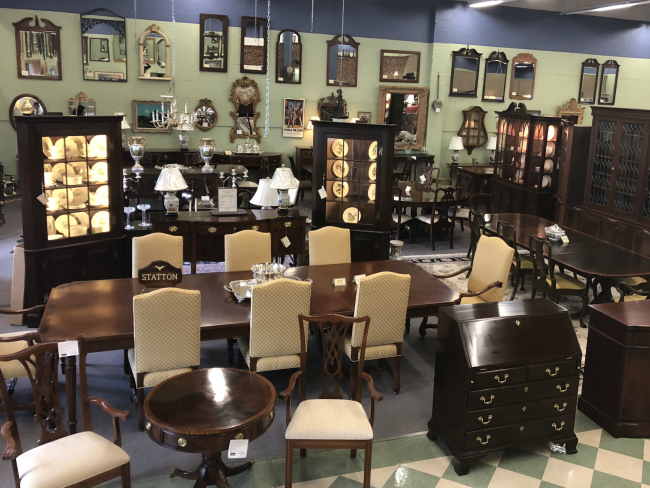 These pictures taken at our Baltimore Furniture Consignment Store show just a small sample of the Quality and Variety you’ll find when you Visit Our Store! 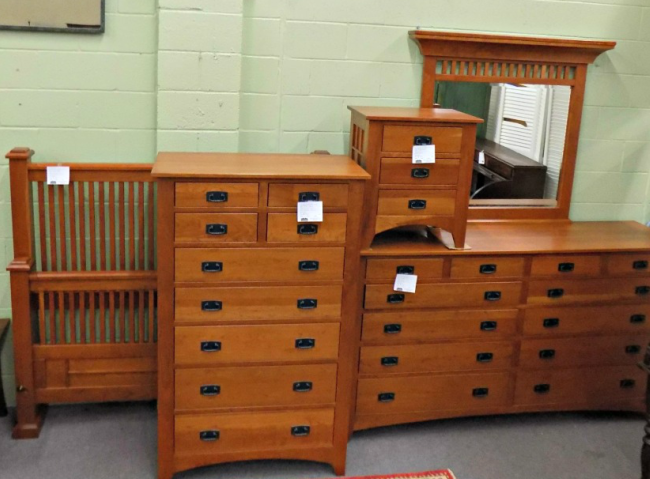 Of course we have Traditional Cherry and Mahogany Furniture from makers like Henkel Harris, Stickley, Statton, PA House, Ethan Allen and More. But we also have Contemporary Styles from Restoration Hardware, Room and Board, Arhaus and Others. So no matter what your style or budget, you can find it at Baltimore and Washington DC’s Biggest and Best Furniture Consignment Store! Visit us just North of Baltimore’s I695 Beltway off I83 exit 16B, where you can check out our dock area and be the first to see pieces as they arrive at the store! Cornerstone Matches Donations To Help Fight Childhood Cancer! 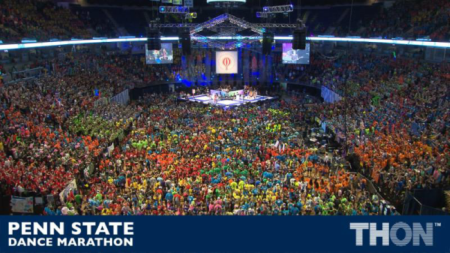 THON is the largest student run philanthropy in the world! While the work they do is a Year Round Effort, it all culminates with a 46 hour dance marathon held every February! Since it’s inception, THON has Raised Over $136 Million to fight childhood cancer! Cornerstone continues their support of THON this year by Matching the first $500 raised in our store! So, your donation goes twice as far when sent through Cornerstone. Just make your THON donation on your next visit to Cornerstone. On Feb. 16, 2018, Cornerstone will count the money raised by our customers and staff and match the first $500! If your interested in how Cornerstone Can Help Your Favorite Non-Profit, click the link below! Cornerstone has an immediate job opening with Flexible Hours and Competitive Pay! Weekly duties can be customized for a 10 to 20 hour work week. Technical Skills and Attributes: Detail Oriented; Internet and software savvy; Can operate / troubleshoot computers and other office equipment such as fax, scanner & printer; Excellent verbal and writing skills; Great customer service skills; Self-starter who can work with minimum supervision. Software Requirements: QuickBooks; MS Office Suite; Excel; Email. Specific Duties: Make entries into accounting software-QuickBooks; Reconciliation of checking accounts and credit cards in QuickBooks; Time Sheets and Payroll via our payroll service; Manage 401K contributions and paperwork; Inventory entry and tracking; Other misc. office duties. Like New Solid Cherry Mission Style Bedroom Set with Queen Bed! Pictured here is a “Super Clean” Bedroom Set that just recently arrived to the store. We placed it in our Preview Room while it waits for a spot on our showroom floor. However, like a lot of our Great Consignment Furniture, it may sell right from the Preview Room! So, if you’ve been searching for a Casual Bedroom Set, this may be the one! Stop in today and “Sneak a Peek” at all the wonderful consignment furniture on our Dock Area and in our Preview Room! There’s Still Time to Get Your Dining Room Ready for Thanksgiving! 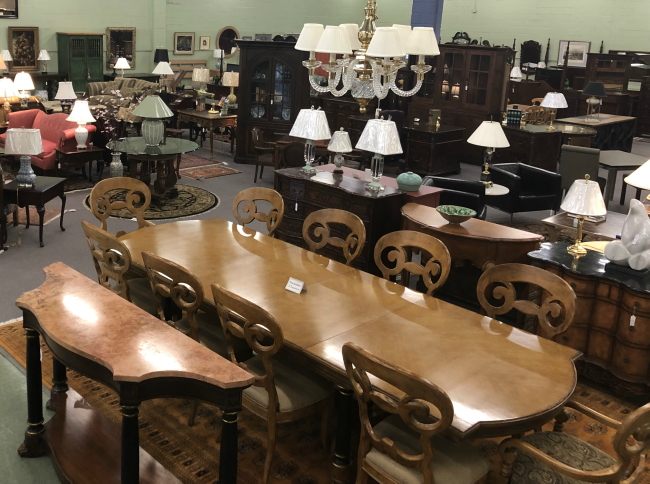 With Baltimore’s Biggest and Best Traditional Consignment Furniture it’s (almost) never to late to get your dining room ready for your Thanksgiving Feast! After all, we will be closed on Thanksgiving Day. But until then we’ll be Selling Furniture and Refilling the Store with More Great Furniture right until the Holiday! 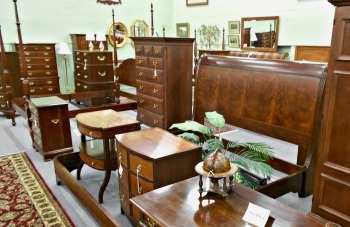 Pictured here is a shot of just some of the wonderful consignment furniture in our store today. We also have a Back Room and Preview Room filled to the walls. So, it’s not to late to get the Table, Sideboard, Breakfront, Server or other piece your dining room may need to make this the best Thanksgiving ever! Top 5 Reasons to Buy Traditional Furniture! Today’s furniture buyers have more choices than ever before. With the click of a mouse or a short drive to their brick-and-mortar store, customers can find furniture to suite any taste. Styles ranging from Country to Mid-Century can be delivered to your door in a matter of days! Here are 5 reasons you should consider buying Traditional Furniture. 1. Style– While traditional forms may vary in popularity throughout the years, they never go out of style. That means when you buy classic furniture (think Chippendale and Queen Anne), you won’t “wish you hadn’t” 10 years later. Many of our parents or grandparents had this happen with their choices of Italian or French Provincial, as well as Victorian. 2. Fit– Most homes are tailor-made to handle the style and scale of traditional furniture. Trying to put Mid-Century furniture into a Classic New England Saltbox style home is like …..well, trying to put Mid-Century furniture in a New England Saltbox style home! In addition, there’s nothing more disappointing than getting a new piece of furniture home that just doesn’t fit the size/scale of your home! 3. Luxury– Classic furniture forms have a richness that give a room a sense of elegance, making the space an oasis. Add a piece with inlay or beautiful carving for even more “pop”. 4. Warmth– While Greys and other “cool” colors come and go, nothing beats the rich warmth and beauty of mahogany and cherry furniture. They’ve been the choice of craftsmen for years. Not only for their initial beauty, but also for the way they develop a rich patina as they age. These pieces make a house a home. 5. 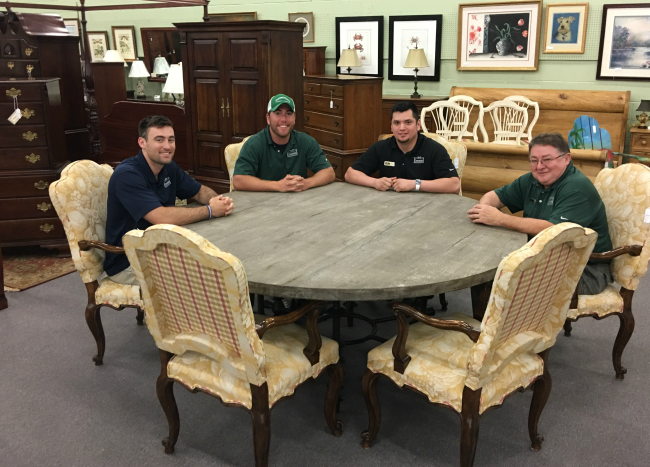 Value– Because Traditional furniture never goes out of style, it is readily available on the pre-owned market. 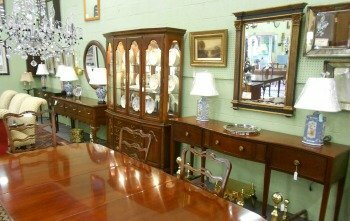 Consignments stores, auctions and Craigslist are just a few places to find great Traditional furniture. I prefer the consignment store approach to get expert advice and guidance. But, I’ll admit I’m biased. Finally, people take the best care of their ‘prized possessions’. So, you’re likely to find the highest quality pieces in “like-new” condition and sold at just a fraction of the original price! Last Chance for Consignment Patio Furniture! With a fresh cool breeze filling the Baltimore air, it’s time to put summer behind us and get ready for some fun fall activities. If one of those activities is sitting around your fire pit enjoying the season, Cornerstone Can Help! We’ve got the final Patio Consignment Furniture of the season. Once these last few pieces are gone, we won’t see more until next spring! Better still, when you mention this post you’ll Get an Extra 15% Off any patio furniture in stock! So, don’t wait! Our inventory is limited and when it’s gone, it’s gone until next year! Consignment Bedroom, Dining Room and More Fill Our Preview Area! If you haven’t been by Baltimore’s Favorite Furniture Store lately, you’re in for a treat! 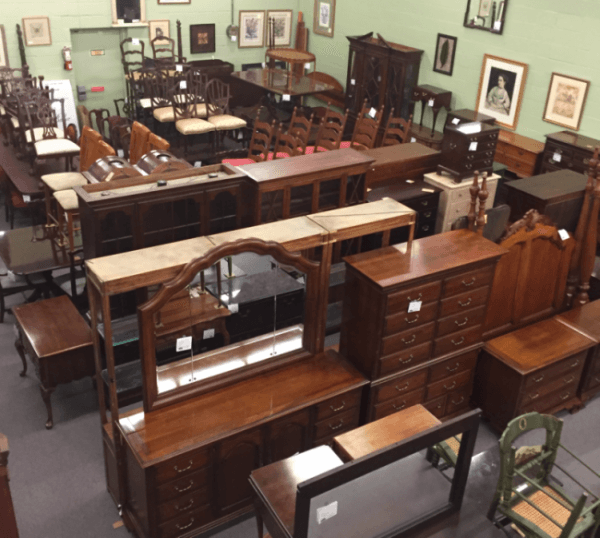 While we’ve always had Baltimore and Washington DC’s Biggest and Best Selection of Consignment Furniture, now we’ve got even more of it! This year has brought us so much high quality furniture that we’ve taken to stacking it in our Preview Space. So, stop in today to see just How Big Our Inventory Has Become! Be sure to look high and low as we’ve filled every foot with Bedroom, Dining Room, Living Room and Occasional Consignment Furniture. Free Furniture Delivery July 27th, 28th and 29th, 2017! If you’ve been putting off buying that new dining room table because you don’t want to borrow the neighbor’s truck, Wait No More! 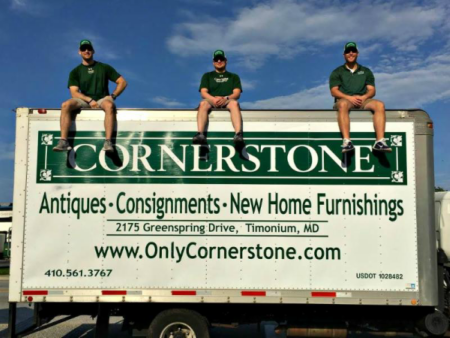 Cornerstone is offering Free Local Delivery for all furniture purchases this week only. If you’re beyond our “local” area, you can Still Save Money! We’ll take $100 off the delivery fee for customers outside of the local area. So, don’t hesitate. This sale is for 3 Days Only and it starts today! Dining, Bedroom, Living Room Furniture and More Fill Our Consignment Store! As we start the month of July here in Baltimore, it looks like the summer of 2017 is going to be Great for Furniture Buyers! That’s because our 9,000 square foot store continues to be filled to the walls with Wonderful Consignment Furniture in a variety of colors and styles. Pictured here is part of the Cornerstone Team getting ready to start a meeting (or possibly a poker game!) around a Solid Wood Plank Top Round Table. Off to the left you’ll see some really nice Statton Bedroom Furniture that just arrived. 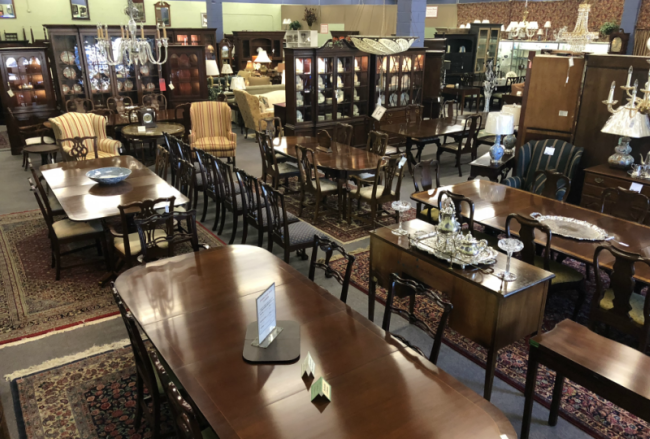 No matter what day you decide to stop by the store, you’ll always finding something new arriving at Baltimore and Washington DC’s Favorite Furniture Consignment Store!